Accidentally slipping into nine dimensional realms with no ability to control the warp feels like sci-fi peppered in for dramatic effect without any logical basis in actual science fiction. While a key plot line of this film is that nine realms are converging, sci-fi is best left for programs that have a true understanding and basis in it. 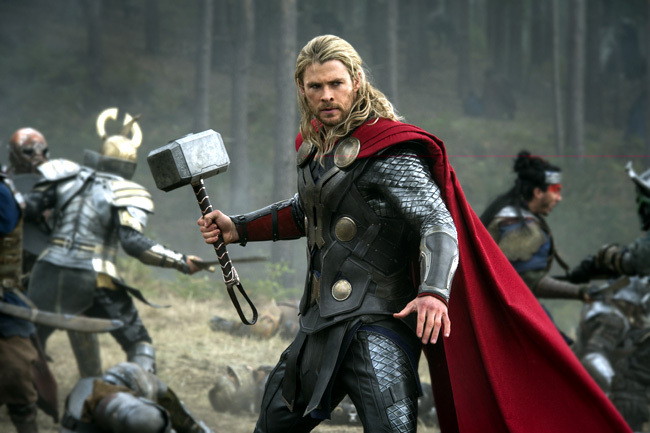 Read Adam Fendelman’s full review of “Thor: The Dark World”. Failed sci-fi aside, what we have here is a barely passable sequel because of the rest of what it is rather than what it fails to be. From high-budget Marvel movies, we’ve come to expect the ability to glaze our eyes over and shut our brains down as we pop popcorn in our mouth, sip on a bucket of soda and bite off strawberry licorice. We can with “Thor: The Dark World” while being relatively satisfied that the story’s lore has been furthered since the Chris Hemsworth show two years ago. Just don’t overthink things too much – and accept this popcorn flick for all that it is – because that’s where the film will fall apart. For example, Thor can spin his hammer fast enough and fly like Superman as if it allows him to helicopter. That’s about the most ridiculous Norse mythology I’ve ever witnessed. “Thor: The Dark World” stars Chris Hemsworth, Natalie Portman, Tom Hiddleston, Anthony Hopkins, Christopher Eccleston, Jaimie Alexander, Zachary Levi, Ray Stevenson, Tadanobu Asano, Idris Elba, Rene Russo, Kat Dennings and Stellan Skarsgard from director Alan Taylor and writers Christopher Yost and Christopher Markus. The film, which opened on Nov. 8, 2013, has a run time of 112 minutes and is rated “PG-13” for sequences of intense sci-fi action and violence and some suggestive content. Continue for Adam Fendelman’s full “Thor: The Dark World” review. Chris Hemsworth as Thor in “Thor: The Dark World”. Submitted by JimG (not verified) on November 10, 2013 - 3:31am. Dude, it’s a movie based on a comic book…it’s not based on science. If anything, the Thor stuff was based on magic and mystical things. Get over it and go watch old Star Trek re-runs. Comic book movies aren’t for you.